2 drawings on paper, lined and laminated (1 sheet) : ink ; left image 4.125 x 3 in., right image 4.125 x 3 in., on sheet 6 x 9.5 in. 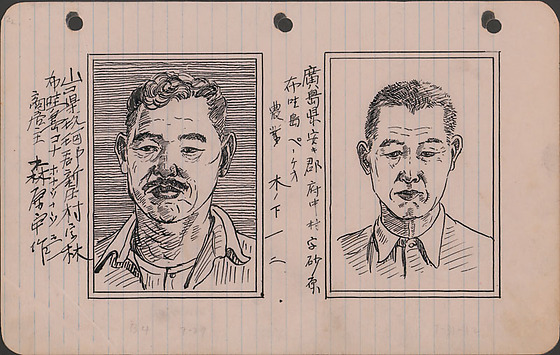 Ink portraits of two men, Yusaku Morihara and Ichiju Kinoshita, at Lordsburg Justice Department Camp, New Mexico, July 24, 1942 and July 31, 1942, respectively. Both drawings have double black line borders. Left portrait of Yusaku Morihara, a shop owner in Honaunau, Hawaii, originally from Yamaguchi, Japan. Morihara wears a shirt under a button-down shirt and faces the viewer as he looks to the left. He has a mustache and curling hair on top. Horizontal lines in background. Visible from shoulders up. Right portrait of Kazuji Kinoshita, a farmer in Pepekeo, Hawaii, originally from Hiroshima, Japan. Kinoshita wears a button-down shirt buttoned at top. He has a crewcut and eyes are downcast in a narrow face. Visible from shoulders up. Written in black ink to left of left image (In Japanese): Yamaguchiken Kugagun Shinjomura aza Hayashi / Hawai to Kona Honaunau 31 / Shotenshu Morihara Yusaku. Written in pencil below left image: B4 7-29. Written in black ink to left of right image (In Japanese): Hiroshimaken Akigun Fujimura aza Sunahara / Hawai to Pepekeo / Nogyo Kinoshita Ichiju. Written in pencil below right image: 7-31-42. Written in pencil, top left corner: 122.